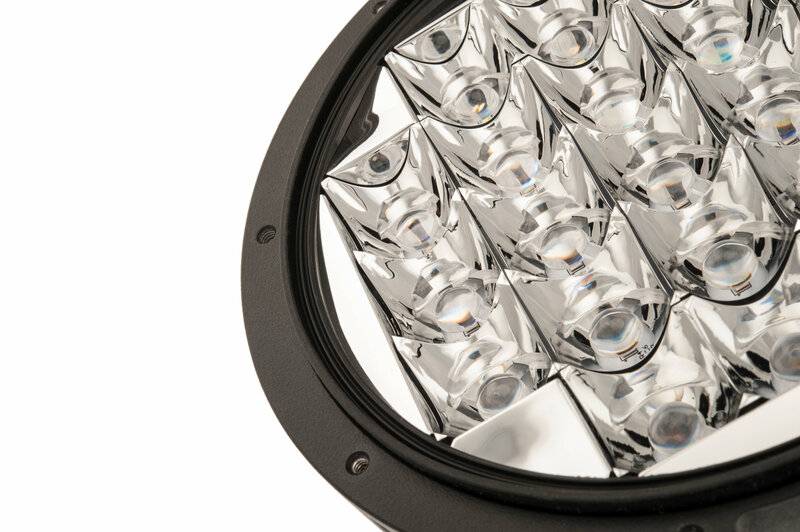 The ARB AR21 Intensity LED driving light packs a serious punch for It's size utilizing cutting edge technology and design paired with 21 LEDs to provide 6950 raw lumens in a compact package. 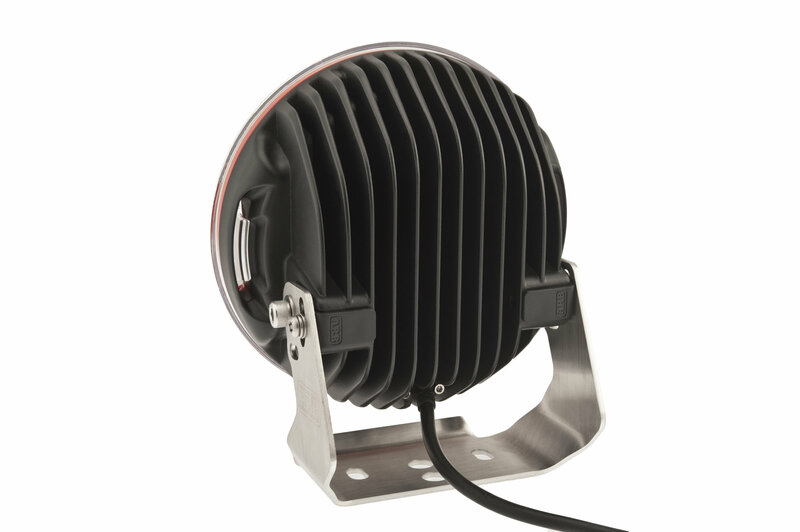 The AR21 is available in either a spot or flood beam configuration and is similar is size to their IPF 900 series light with an outer diameter of 7.25 inches. 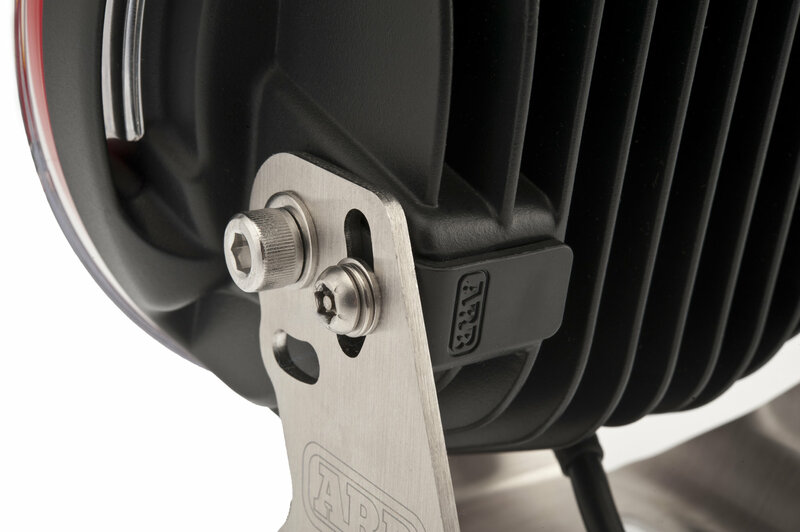 The AR21 features a unique molded rubber seal between a polycarbonate lens and pressure cast aluminium body that in conjunction with a Gore® breather and sealed Deutsch electrical connector ensures a waterproof rating of IP68 with submersion of up to 10ft. Built from corrosion resistant materials, the aluminium body is finished in a textured polyester powder coat that passes the ISO7253, 3000 hour salt spray test. The distinctive red lens retaining bezel is UV resistant. 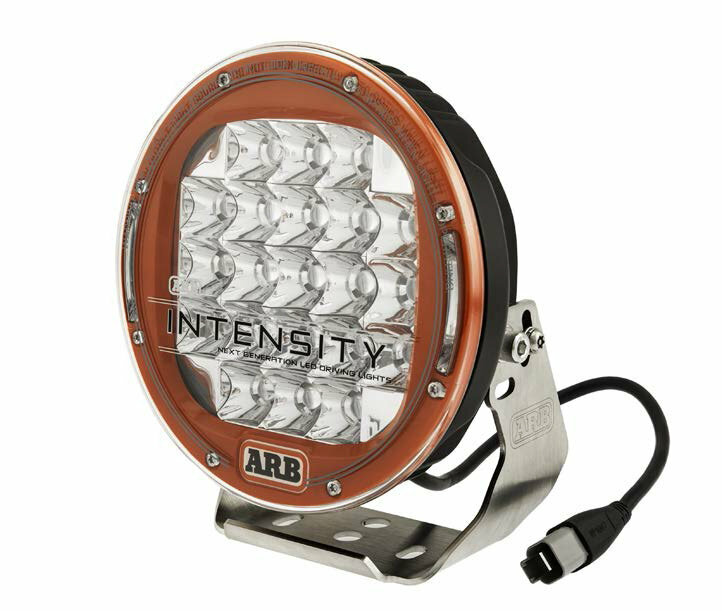 This combined with the 304 stainless steel mount makes the ARB Intensity light extremely weather and corrosion resistant. Lights are sold each. Cooling - The pressure cast aluminium housing acts as a heat sink to draw heat generated from the electronics away from the LED array, thus increasing efficiency and life of the LEDs. Cooling fins cast into the rear of the housing increase the cooling surface area of the light body by more than 200%. Security - Each light has a cap screw pivot bolt with tamper proof TORX® security fasteners used on the adjuster nut for improved security. Electronics - The heart of the light is its electronics. Using SMD type Osram LEDs for increased efficiency and brightness, the circuit board sits deep within the light body,offering protection to the advanced circuitry while mounting directly to the cast housing for optimum heat transfer and cooling efficiency. Optics - The advanced Patent design optics incorporate both a reflector and lens to control the light emitted from the LED with 93% efficiency. Designed to offer different light projection patterns, they are the only components that differ between the flood and spot model lights with the flood offering 20° spread and spot a 10° beam. 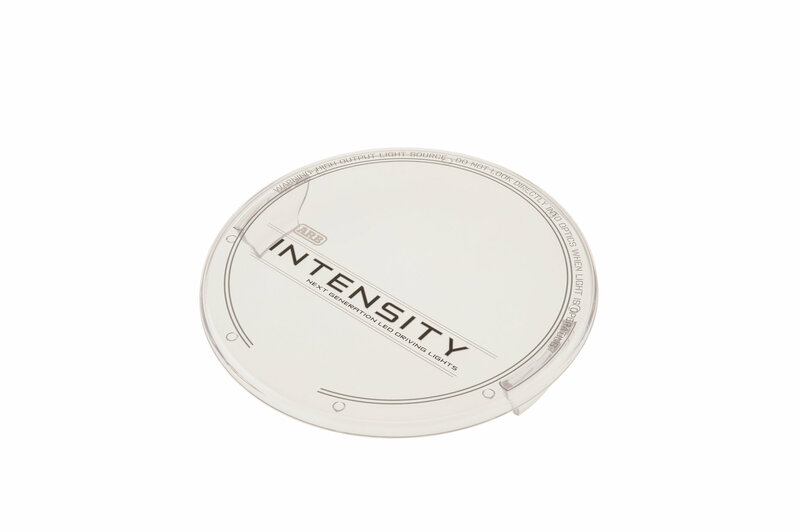 Advanced Sealing - A unique molded rubber seal sits between the polycarbonate lens and cast aluminium body, creating a watertight and dust proof seal to allow the light to achieve an IP68 rating - meaning complete protection against dust ingress and submersion beyond 10ft. High pressure cast A360 aluminium body. UV stable moulded polycarbonate lens cover. Multiple position stainless steel mount. Amp draw 6.1A @ 14.4V. Lux @ 10m (33Ft)  2552 (spot) 584 (flood). Weight 2.5Kg / 5.5Lb complete. These lights are great! Expensive, but definitely the best. The quality is outstanding. I thought I purchased 2 lights for 485.00 and found out when 1 light showed up that 485 was the cost of 1 light. Lol. But it is well worth it. I am buying 2 more. No. Just plain no. Please do yourself a favor and get one of the Quadratec light kits. This light is brilliantly built and is a quality product. The problem is - your $1,000 only gets you the two lights. No wiring harness or loom. If you buy a Quaratec kit, you can get four lights and wiring to hook it all up with factory connectors. And, you will be paying much less. You will also be giving that money to a company that cares for its customers. One that knows the value of a satisfied customer. Quadratec has learned that its foundation has been built upon the backs of its loyal customers. Something ARB should take note of. For the money I spent, I expect ARB to give me instructions on installation for my specific make and model of vehicle. They do not. Sad. This is a product sold by a company who doesn't care at all that you spend $1,000 with them. A very minimalistic bit of kit for a lion's share of your hard earned dough. Buyer beware! ARB has an excellent reputation so when it came time to add auxiliary lights I knew exactly what I wanted. I decided to go wth the 7 inch size as they're less expensive than the 9 inch and they look better perched on my light bar. If I were attaching these directly to the bumper, I would have been tempted to get the larger size. Installation was pretty straightforward, and the included instructions are excellent. 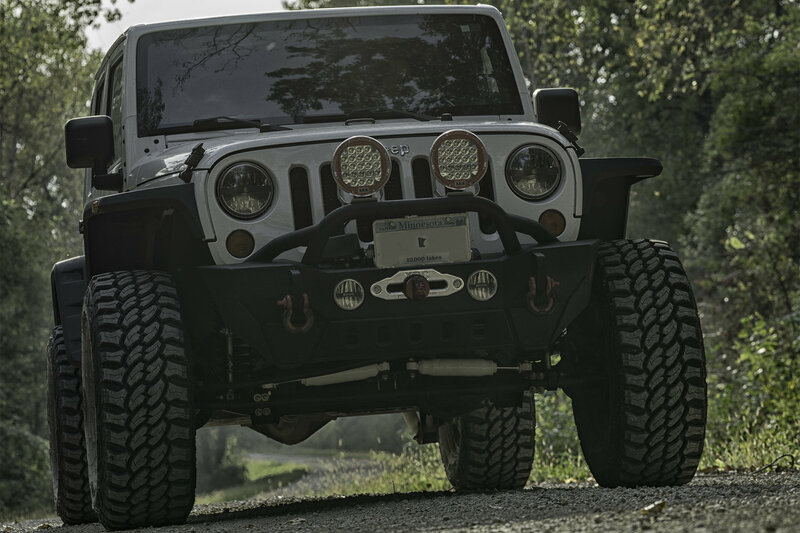 Simply attach the lights to a bracket, then bolt the bracket to the light bar. I drilled a hole in my bumper and ran the harness through the hole and underneath the grill for a cleaner look. Hook up to the battery. Drill a hole in the firewall and run the switch into the driver's compartment. I decided not to mount the switch on the dash with the double edge tape because sooner or later the tape always fails. So I tucked the switch into the mesh pocket underneath the heating controls in front of the auto trans shifter. The switch has an LED light on it, making it easy to find in the dark. Took the lights out for a spin and man, they are bright! I wasn't sure what to expect given that I'm already running stock LED headlights. Definitely for off-road use only, lol. So they look good, work great and and are plenty rugged. I'm looking forward to years of service. Highly recommend if you're looking for high quality LEDs in an old school package.